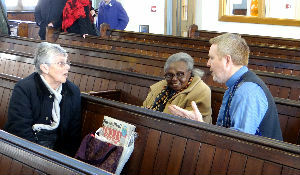 Although we are a Methodist church the people who come to The Square are from different backgrounds, age groups and walks of life. Some Methodist, some from other Christian denomination and some with no particular background in church. Details of services and times can be found on our Worship page. 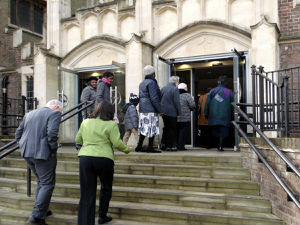 People start arriving at the church ten to fifteen minutes before the service starts, at 10.30am. Once you enter the front doors you will find yourself in the welcome area, where you will be greeted, handed information about this week’s activities and made to feel welcome. Doors lead through to the church and you may sit where you like. There is no dress code and most people come fairly casually dressed. Although there are hymn books and bibles available in the seats all that you need will be projected onto the large screen at the front and be explained as we go along. 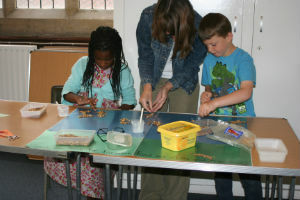 Many of the services include activities for children. There is a crèche, a play area in the church and S-Club for 0 to teens, where young people can go if they wish to take part in age appropriate activities during the service. We have a loop system for the hearing impaired, full wheel chair access to the church, disabled toilets in the welcome area and wheel chair spaces in the pews. Toilets can be found in the welcome area. The church also has free Wi-Fi from which you can access our website and Facebook page. Coffee and tea are served after many of the services and details announced. If you would like to come to church but are unable to get there yourself please contact us so that a lift can be arranged. The church is located in the centre of Dunstable on Ashton Square near the crossroads of High Street South and West Street. Exit the M1 from Junction 9 (northbound) or Junction 11 (southbound) and follow the signs for Dunstable. Ashton Square car park is behind the church. This is free on a Sunday. Pay and display at certain times and accessed from West Street, turning by the Police Station.